Reasons To Cruise > Cruise Blog > New Ships on Order > So How Exactly Do They Squeeze Mega Ships Along The Narrow River Ems? Papenburg is a little known small German city. Its biggest claim to fame is the large Meyer Werft shipyard. The order books are bursting at the seams as the shipyard constructs some of the largest and most innovative cruise ships available right now. Building these mega ships is only part of the story. Once these mammoth beasts emerge from the building, shed there is the small matter of somehow transporting the ship to the sea. You see, the Papenburg shipyard is just shy of 20 miles inland. Now you will be asking why build a shipyard so far inland? The answer is a masterstroke of genius. By basing the shipyard so far inline it is unaffected by the North Seas storms. The size and weight of these ships prohibit transportation by any other means than water. So the process known as the River Ems conveyance takes place. It is a carefully choreographed procedure that can take upwards of 10 hours. The ship travels at the same as a typical 40-year-old man. In fact, many cruise ship enthusiasts to just this, following the ship on foot or by bicycle. The process is highly weather dependant. Strong winds and heavy rain, in particular, could cause tremendous problems – the last thing the shipyard wants to do on a brand new ship is to be forced to repair it, potentially pushing the delivery date back at a cost of immense sums. The shipyard waits for a full or new moon, and for the wind speed to drop below 20 knots. Large ships like Quantum of the Seas and Norwegian Escape are particularly tricky vessels. With just a few centimetres clearance on each side of the ships, there is no room for error. Tidal barriers have to be closed to ensure there is enough water clearance to allow the ship to traverse the River Ems without risking grounding. And then there is the small matter of protecting the propellers. If the ship travelled forward along the river, there is a strong risk that the propellers would be damaged as the ship navigates the twists and turns. As if the perilous journey was not difficult enough the entire process is performed in reverse, keeping the propellers safely in the centre of the river throughout the process. A pair of tug boats helps guide the ship along its journey. Just to throw some more problems into the mix, there are some low bridges and cables that cross the River Ems that prevent an easy passage. Four bridges need to be opened or removed entirely to allow the ship to pass. Electricity cables are shut down in three locations that cross the river, causing them to contract and rise, allowing the ship to pass. The clearance is as little as 1.8 metres. The River Ems conveyance is a process that has taken place regularly since 1795. The shipyard is as busy as ever, and there are many more conveyance projects on the horizon. 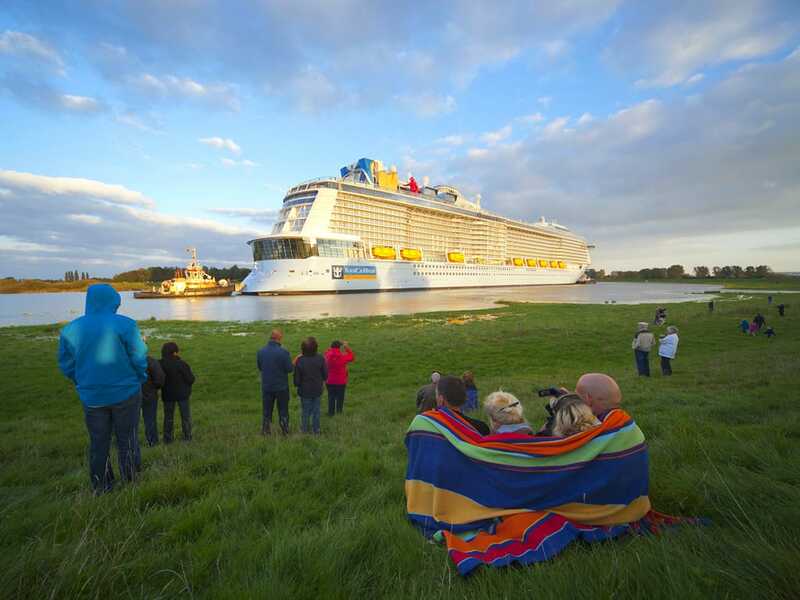 Notable ships that have been squeezed along the tiny river in recent times include Quantum of the Seas, Anthem of the Seas, Norwegian Escape, and Ovation of the Seas. Have you followed a ship on its journey along the River Ems? If you have any tips for the best viewing spots, please share them below in the comments. 12 March 2016 21 February 2017 So How Exactly Do They Squeeze Mega Ships Along The Narrow River Ems?